Widowhood is trapping me unwillingly. ~ First line of the poem "My Husband is Leaving"
Sweta Srivastava Vikram captures well the many different voices of Hindu widows in India in this collection of forty-nine poems. The poems in Wet Silence speak of grief of all kinds, including that of love lost and of lost opportunities. The poetry I like the best is the kind that speaks to me on an emotional level, and Sweta Vikram's poetry did just that. There was not a poem in this collection that did not work for me, that did not draw out my emotions in some way. How do I tell anyone what you gave me? we came crashing like a wave. When I first saw mention of Sweta Srivastava Vikram's Wet Silence, I knew I wanted to read it. This collection appealed to me most because it is about women facing hardships, in addition to being another opportunity to step outside my own experiences and culture to learn about another. 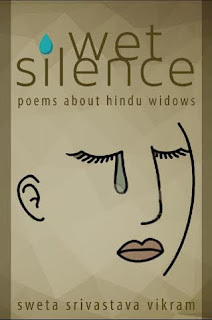 Wet Silence gives readers a glimpse at the cultural restrictions placed on many Hindu women after the death of their husbands. They are not allowed to remarry and must live as if in mourning the rest of their lives. From what they wear to the food they eat to how they behave, they are required to adhere to strict religious and cultural norms. Just as the first sentence quoted at the beginning of this review, widowhood is its own sort of trap for these women. on separate shelves in the same closet. A few of the poems are written from the perspective of the mistress and others from a wife whose husband was unfaithful. There are poems about abused wives as well as those who were well loved. There is one about an ungrateful son. Sweta Vikram covers a wide range of experiences in her poems, writing about gender expectations and inequality; and about the freedom that comes with the death of spouse as well as that feeling of being trapped when one's spouse is gone. in the throat long after the fish is dead. The book is divided into three sections, the first being “I can hear a white cotton sari weaving at the shop,” which were the poems that spoke to me most clearly--perhaps because I imagine these are how I might feel to some extent if I lost my husband. There is such sorrow and loneliness within the poems. The second section, “I didn’t promise to sleep in your shadow,” is made up of poems that speak of a mixture of feelings, each one very different: that of loss and love, of feeling burdened; of anger and frustration, especially by those who had been abused or were married to men who were unfaithful. The voice of the women in the third section, “Silence became my lover, that’s why,” who feel less constrained by cultural and religious expectations. You never pulled yourself together for me. I'll indignantly rise, and sing songs of freedom. I have read each of the poems at least twice, some even more than that. Each of the poems are emotional and have a power all their own. They spoke to me as a human being as well as as a woman. So much comes through in so few words regarding the cultural complexities each of these women faced. I loved that about this book. To learn more about Sweta Srivastava Vikram and her books, please visit the author's website. Many thanks to the Poetic Book Tours for the opportunity to be a part of this book tour. Review copy provided by the publisher for an honest review. Thank you so much for being on the tour for this phenomenal book; there is so much said in an economy of words -- it is doubly powerful. Sweta is a true poetic talent. Serena - Thank you for letting me be a part of the tour! This is such a heartfelt and memorable collection of poems. I am glad I had the opportunity to read it. I still think about it now. I love it; and I'll likely read it again. This sounds absolutely fascinating and heartbreaking. I'm not the biggest poetry fan but these sound so emotional and so real I think I would enjoy the read. I never would've even looked twice at this one but I'll have to add it to my library list. Katherine - It is! These poems are very approachable, even to someone who doesn't read poetry often, I think. I hope you do get a chance to read this collection. I rarely read poetry, but this sounds lovely. Stephanie - I don't often read poetry either, although I am always telling myself I should. I've seen this book around but yours is the first review I read. This sounds like an emotional read. Melody - The poems are emotional. It was hard not to get choked up reading many of the poems. I enjoyed your review. This sounds like a very moving book of poetry. Pat - It really is! I'm in love with these poems. Poetry has always been a big part of my life, but with a few notable exceptions, I return to old favorites like John Donne and T.S. Eliot and Dylan Thomas over and over again, but the excerpts from Vikram's poems that you have chosen are so touching that I am adding Wet Silence to my wish list. Jenclair - I do hope you get a chance to read them, Jenclair! They are such beautiful poems. Wow, this book sounds amazing! I never read poetry - I find that I never get it. But your review has made me inclined to give this one a try. Athira - Poetry often intimidates me because I'm afraid I won't get it. And that is true for some, but not always. I try to remind myself of that now and then. This is a good collection--I don't think you would have that problem with these poems.